Janeth (Far Right) is a gifted leader and teacher. “One of the things I love most about CHE is that the ministry enters the community like Jesus entered communities, without excluding anyone. The women who come are a testimony of how CHE Entered the community. CHE is acting upong the Great Commission – I love it! CHE ministry works without thinking of denominations, or of social classes. For example, we have Catholics, evangelicals, and non-believers all working together: there is good communication, and we have good relationships. 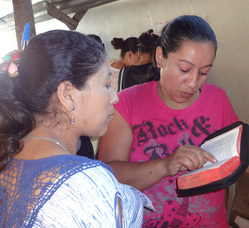 We look for those in the community who really need the gospel, instead of staying with the Christians. “Darling Janette Lopez Ramos is a trained lawyer who has been working with CHE in Nicaragua since 2002 when she began working with the community of San Juan near the city of Boaco. She eventually was responsible for setting up the Nicaraguan Woman’s Cycle of Life programs throughout Nicaragua. 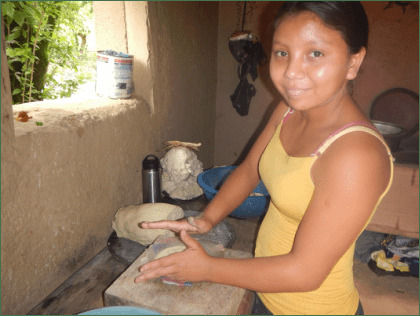 Recently Darling and her husband Ramirez Lopez (Chico), a pastor of a Managua church, took the leadership role in organizing and setting up CHE programs in ten communities on the Island of Ometepe. Currently Darling and Chico are working to establish CHE communities in Northern Nicaragua near the city of Ocotal.